Castle Rock Transportation starts with Interstate 25 which provides easy access to Colorado’s Front Range urban corridor, including links to public transit, I-70, and several state highways. The Town of Castle Rock will help finance limited transportation services for Town residents who do not have access to personal transportation or who are unable to drive. These services will be avaliable through South Suburban Taxi and the Castle Rock Senior Center. Click here for more information about these Castle Rock transportation services. Denver International Airport (47 miles): The nation’s fifth-busiest airport provides direct flights to over 100 destinations. 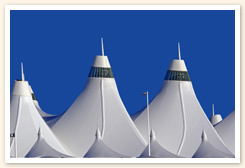 Colorado Springs Municipal Airport (45 miles): Over 2 million passengers fly COS each year. Centennial Airport (19 miles): For private and corporate aircraft. RTD Light Rail: Connect at the Lincoln Station Park & Ride for regional commuter trains. Amtrak: Daily service from Union Station in downtown Denver. Castle Rock Development Company is pleased to announce that the Prairie Hawk street widening project will begin this spring, as promised. Construction is planned to begin the week of May 8th and is scheduled to continue into late-fall. This phased project will impact traffic and Castle Rock transportation on Prairie Hawk between Fire Station No. 4 south to The Meadows property boundary. Detours, lane closures and lane realignments should be expected.